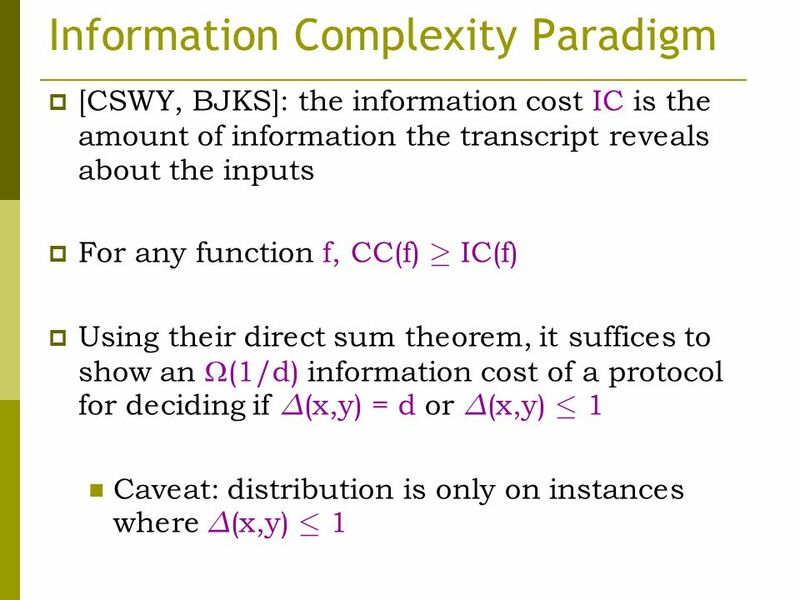 The Data Stream Space Complexity of Cascaded Norms T.S. Jayram David Woodruff IBM Almaden. 9 High Level Ideas: F k ± F p 1. 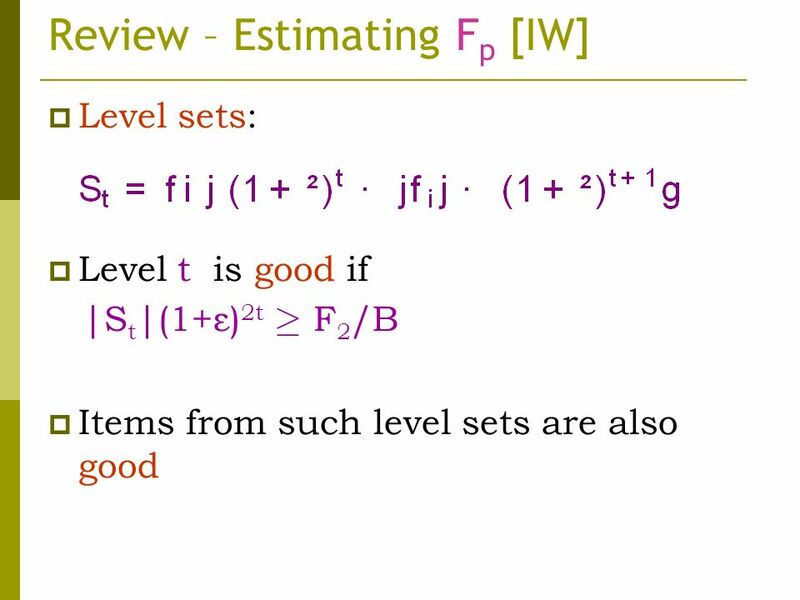 We want the F k -value of the vector (F p (Row 1), …, F p (Row n)) 2. 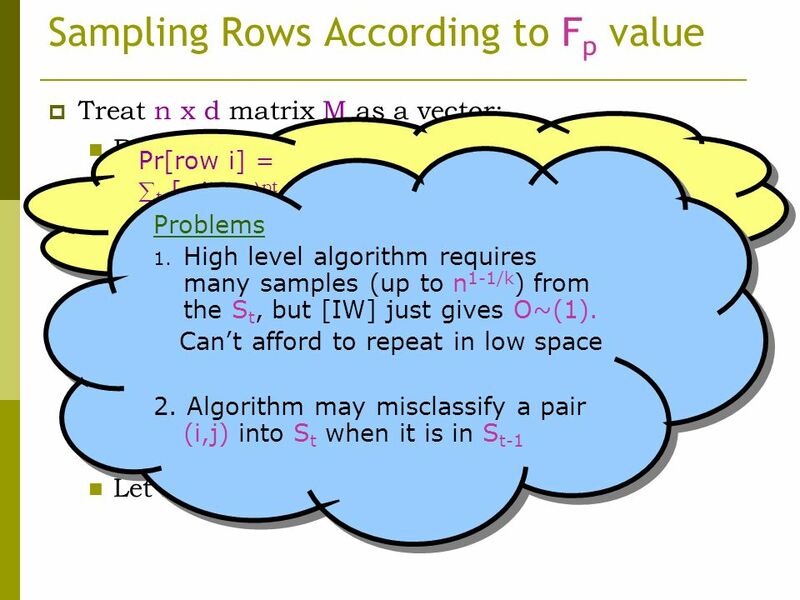 We try to sample a row i with probability / F p (Row i) 3. Spend an extra pass to compute F p (Row i) 4. 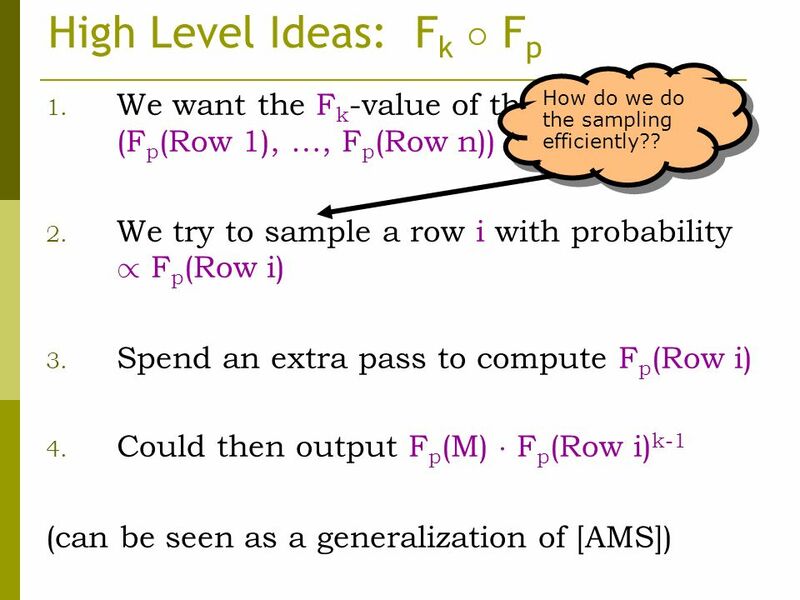 Could then output F p (M) ¢ F p (Row i) k-1 (can be seen as a generalization of [AMS]) How do we do the sampling efficiently?? 13 High Level Ideas: F k ± F p 1. 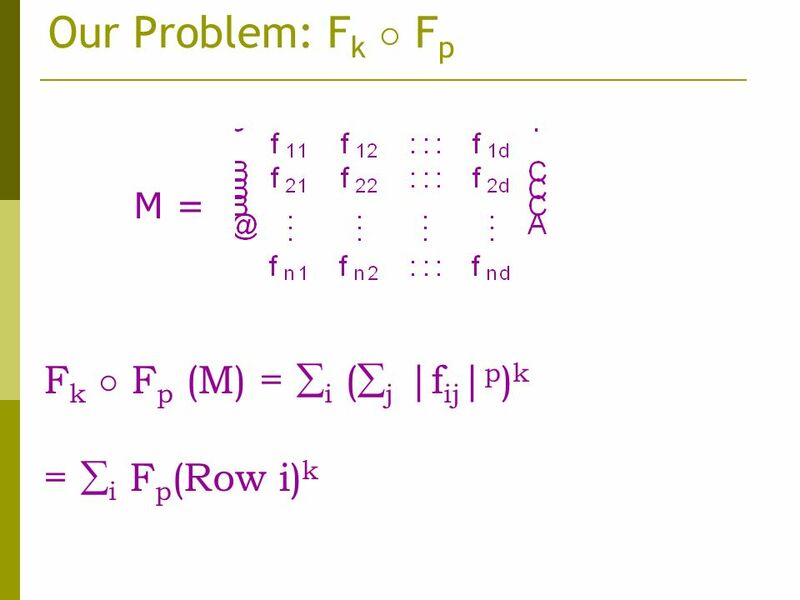 We want the F k -value of the vector (F p (Row 1), …, F p (Row n)) 2. We try to sample a row i with probability / F p (Row i) 3. Spend an extra pass to compute F p (Row i) 4. 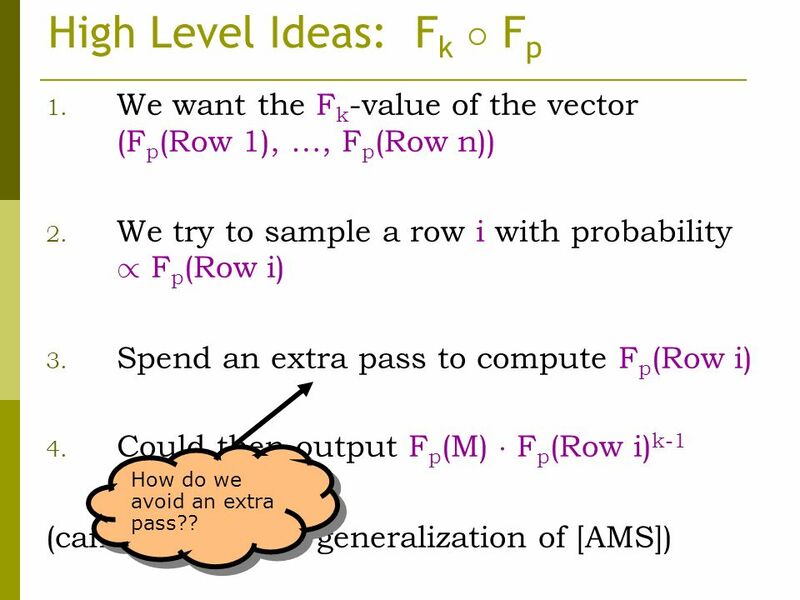 Could then output F p (M) ¢ F p (Row i) k-1 (can be seen as a generalization of [AMS]) How do we avoid an extra pass?? 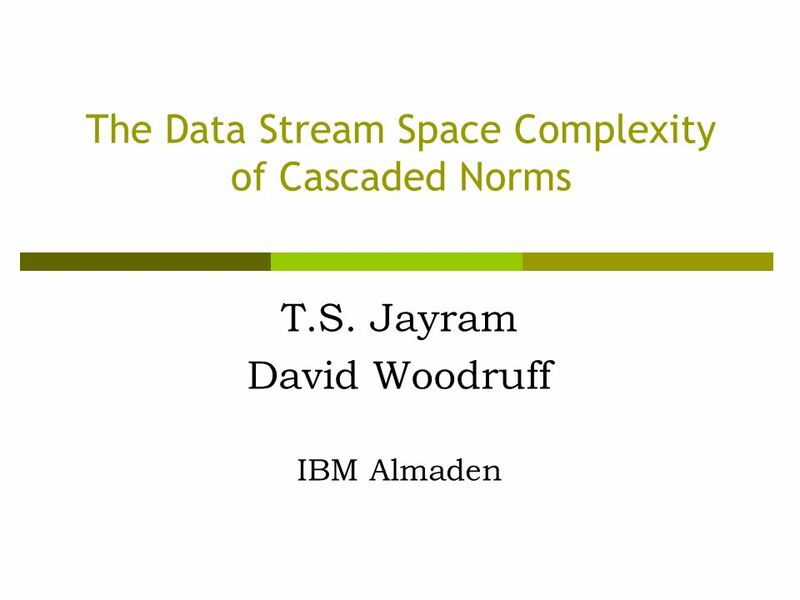 Download ppt "The Data Stream Space Complexity of Cascaded Norms T.S. Jayram David Woodruff IBM Almaden." 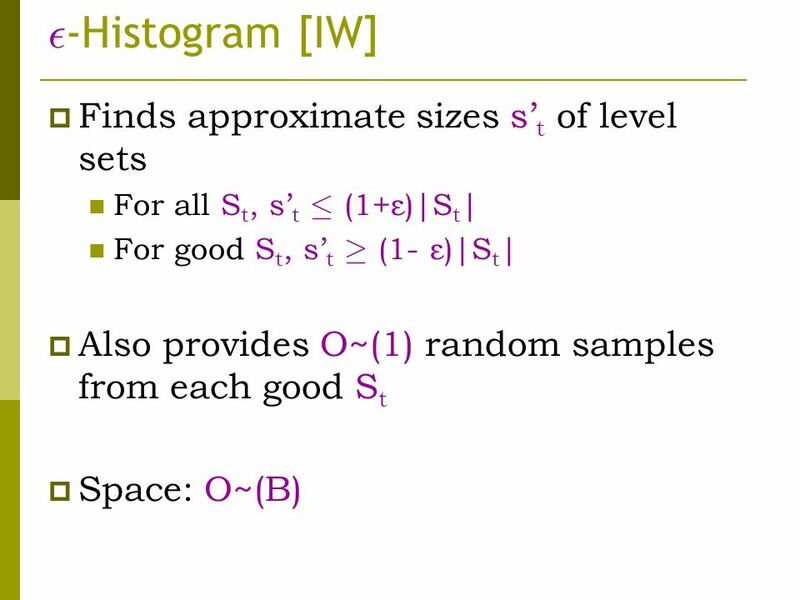 Rectangle-Efficient Aggregation in Spatial Data Streams Srikanta Tirthapura David Woodruff Iowa State IBM Almaden. Fast Moment Estimation in Data Streams in Optimal Space Daniel Kane, Jelani Nelson, Ely Porat, David Woodruff Harvard MIT Bar-Ilan IBM. 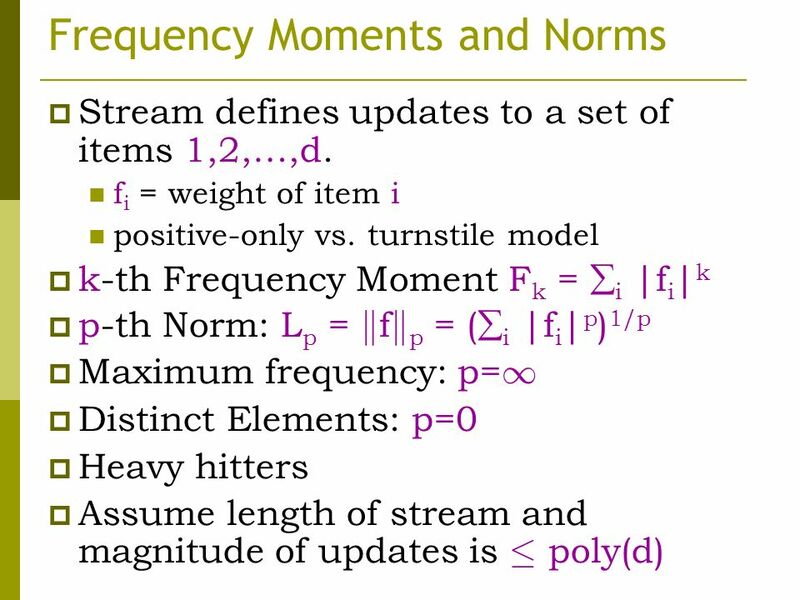 Optimal Approximations of the Frequency Moments of Data Streams Piotr Indyk David Woodruff. 1+eps-Approximate Sparse Recovery Eric Price MIT David Woodruff IBM Almaden. 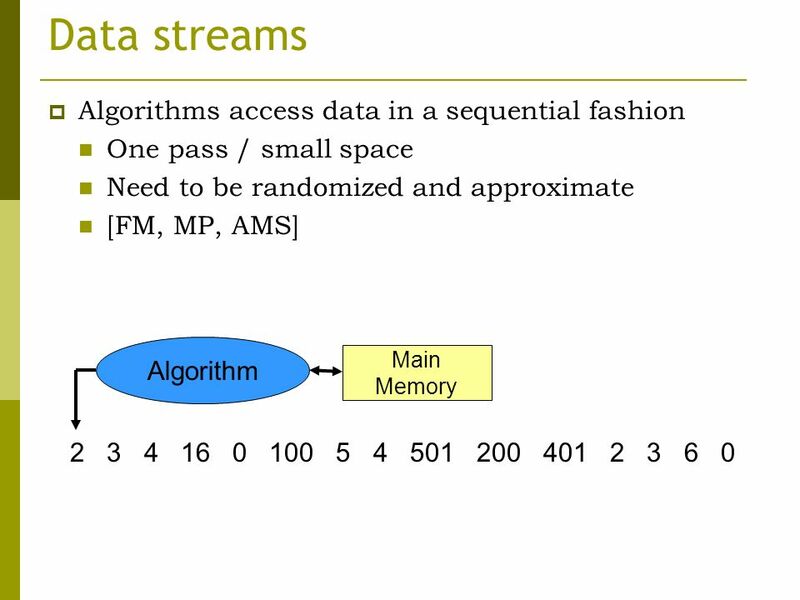 Tight Bounds for Distributed Functional Monitoring David Woodruff IBM Almaden Qin Zhang Aarhus University MADALGO Based on a paper in STOC, 2012. Tight Bounds for Distributed Functional Monitoring David Woodruff IBM Almaden Qin Zhang Aarhus University MADALGO. 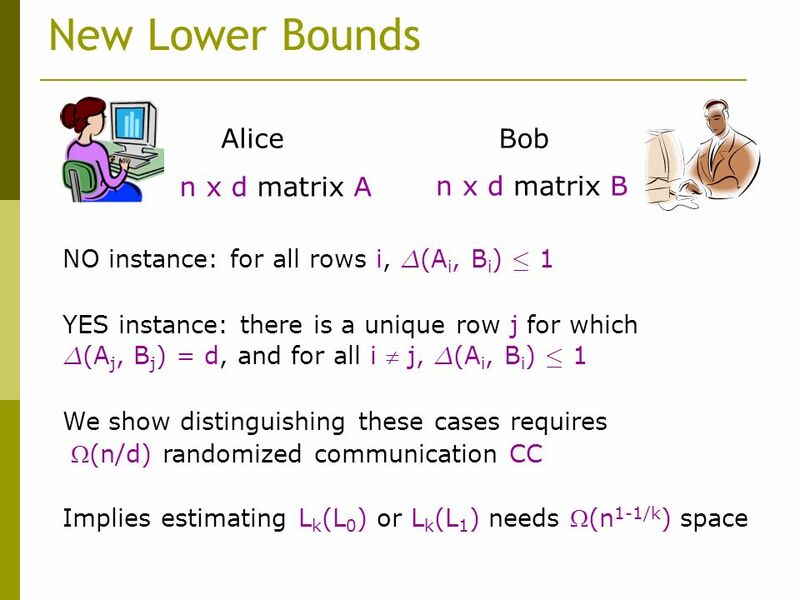 Lower Bounds on Streaming Algorithms for Approximating the Length of the Longest Increasing Subsequence. Anna GalUT Austin Parikshit GopalanU. Washington. 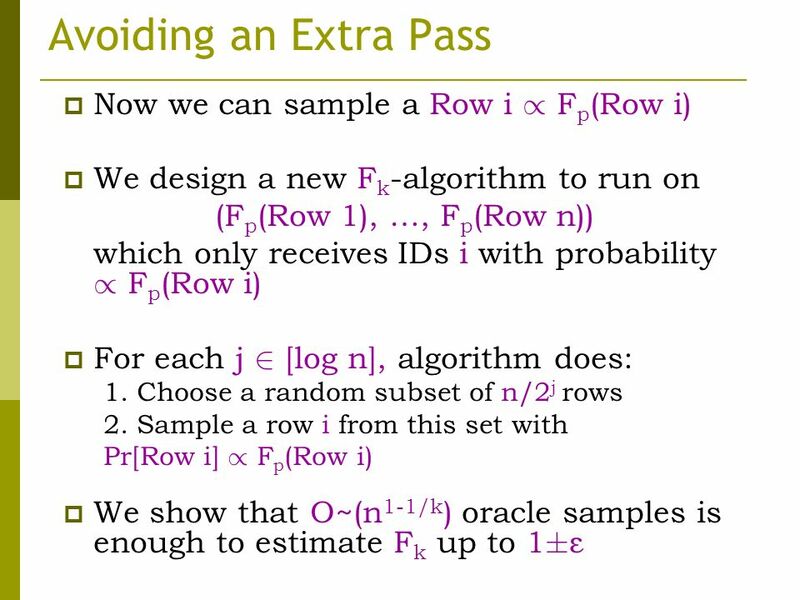 Estimating the Sortedness of a Data Stream Parikshit GopalanU T Austin T. S. JayramIBM Almaden Robert KrauthgamerIBM Almaden Ravi KumarYahoo! Research. 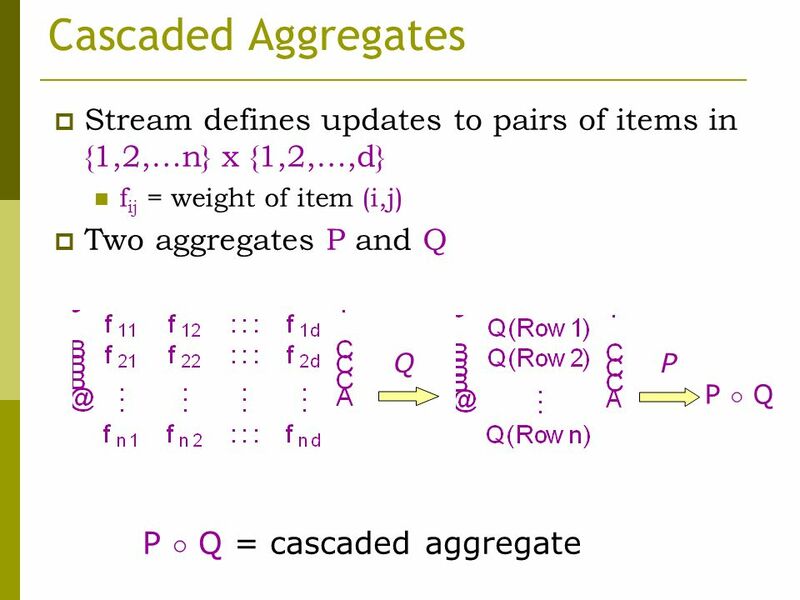 Numerical Linear Algebra in the Streaming Model Ken Clarkson - IBM David Woodruff - IBM. 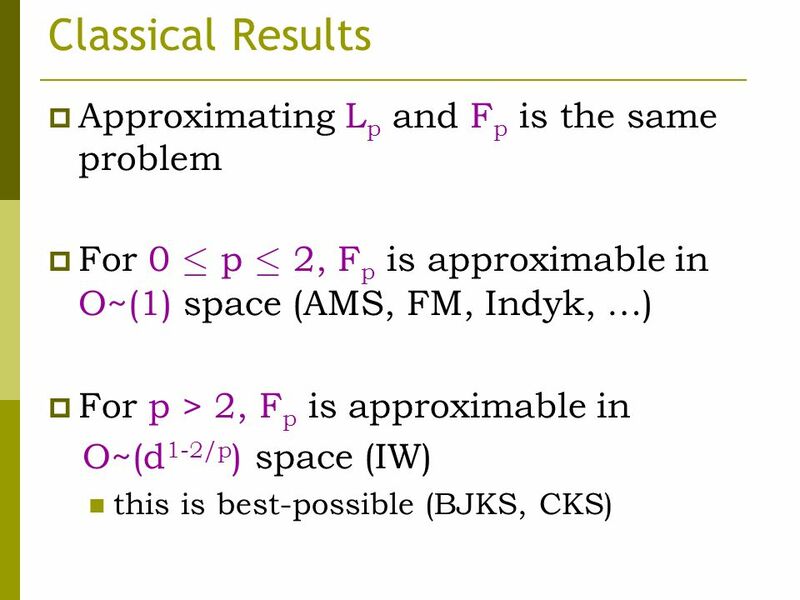 Optimal Space Lower Bounds for all Frequency Moments David Woodruff Based on SODA 04 paper. 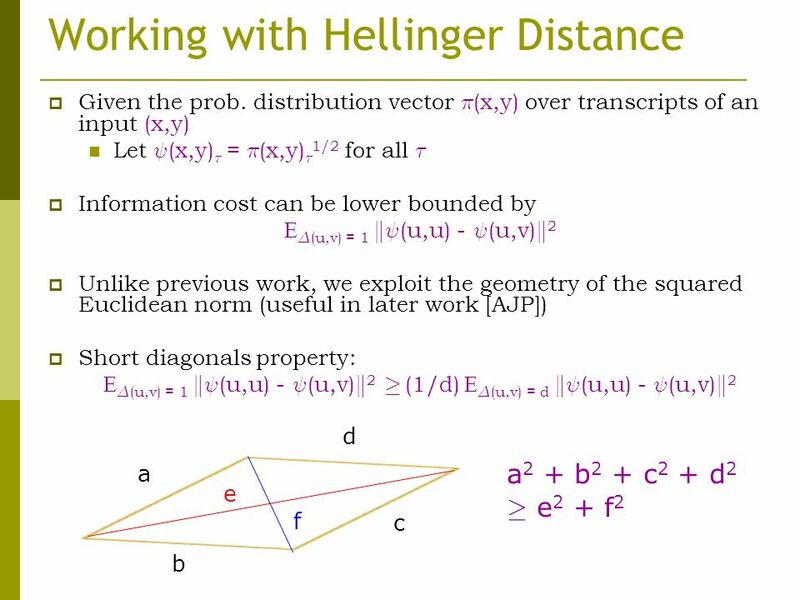 The Average Case Complexity of Counting Distinct Elements David Woodruff IBM Almaden. Optimal Bounds for Johnson- Lindenstrauss Transforms and Streaming Problems with Sub- Constant Error T.S. Jayram David Woodruff IBM Almaden. Sublinear-time Algorithms for Machine Learning Ken Clarkson Elad Hazan David Woodruff IBM Almaden Technion IBM Almaden. 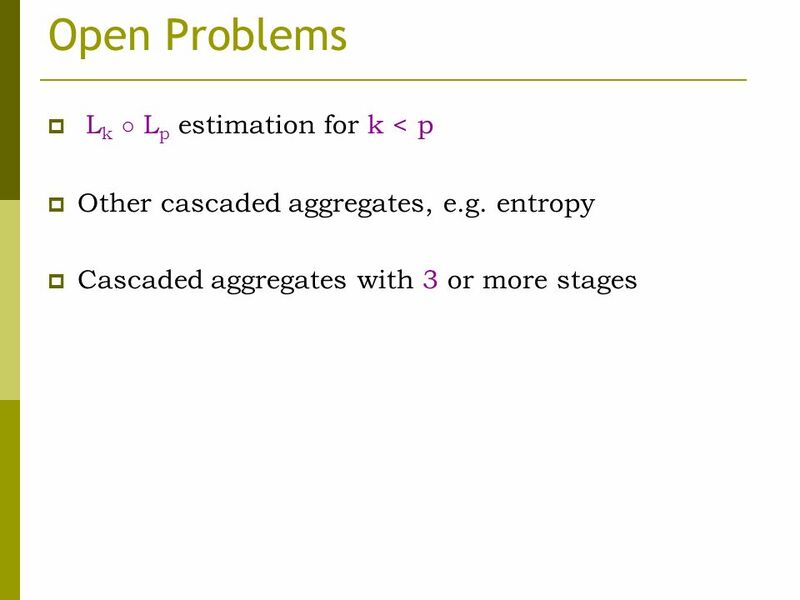 Tight Lower Bounds for the Distinct Elements Problem David Woodruff MIT Joint work with Piotr Indyk. 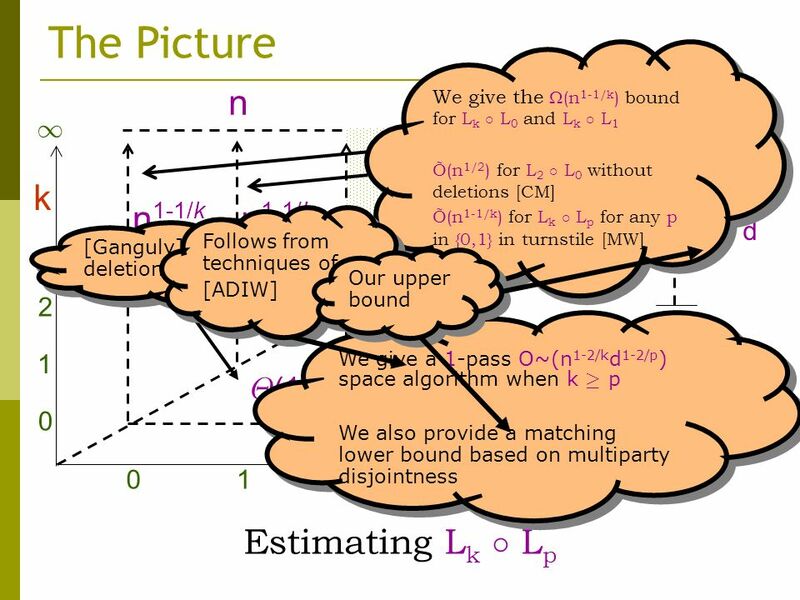 Subspace Embeddings for the L1 norm with Applications Christian Sohler David Woodruff TU Dortmund IBM Almaden. 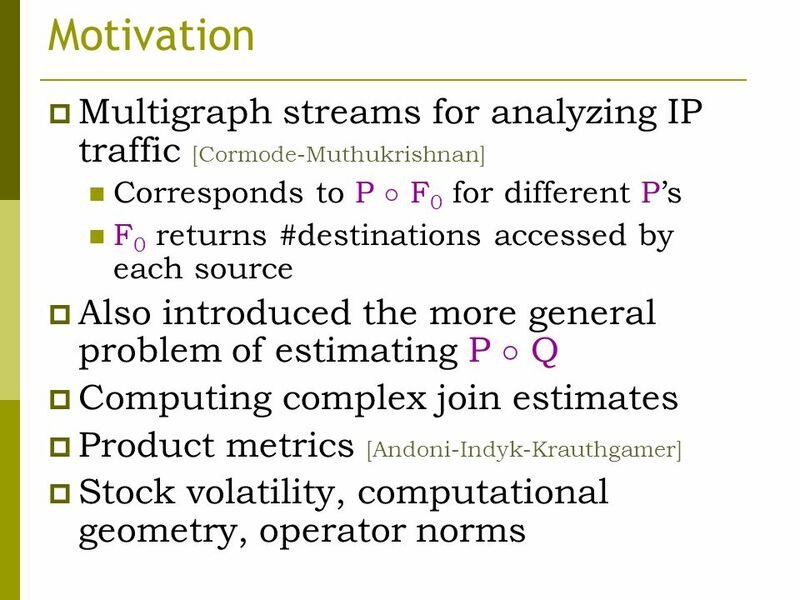 Data Streams and Applications in Computer Science David Woodruff IBM Almaden Presburger lecture, ICALP, 2014.